Does Samsung's Galaxy Nexus live up to the Android 4.0 Ice Cream Sandwich hype? 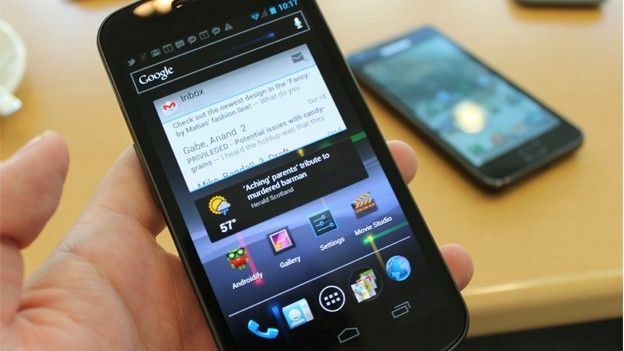 The Samsung Galaxy Nexus will rank as one of the year's biggest smartphone launches, and it heralds the release of an operating system that will shape the course of 2012 as well. The turbulent market means one bad release could be fatal for one of the big players, and with the positive release of iOS 5 loaded with cool innovations such as Siri, the pressure is on Google to enchant consumers all over again. There's no denying it, the Samsung Galaxy Nexus is a giant. The 4.6” screen continues the industry's current obsession with supersizing our smartphones, and anyone who's short on handbag space will probably want to look elsewhere. It dwarves the no-so-compact iPhone 4S, and the pocket busting bulk will be an instant deal-breaker for many people. However, it weighs exactly the same as the iPhone 4S at 140g. What it doesn't have though is support for a micro SD card, or any storage card for that matter, and it can't be used a mass storage device either. That means you can't plug it straight in to your PC and download media on to it - shame because Android 4.0 natively supports hooking up mobile devices to your PC via USB. A strange absence from Samsung. While it is large, the Nexus is still very slim, and fits snugly in the hand. There's a textured back, which adds grip, and the physical buttons are well positioned, with the wake/sleep button ideally placed next to your thumb in the right hand, or index finger of the left. When you start the phone, the quality of the giant 4.6” glass panel is immediately apparent. Samsung has included a 1280x720 AMOLED screen, which is simply mind-blowing, with deep vibrant colours, and pin sharp detail. Blacks do look pixelated on close inspection, but overall, the picture is superb. The Nexus is aligned very closely to Samsung's extremely popular Galaxy S2 handset, featuring the same Texas Instruments 1.2GHz processor. However, disappointingly and perplexingly, the camera has been downgraded to 5MP. Image quality is still perfectly acceptable, and unlike the Galaxy SII, the Nexus enjoys near instantaneous shutter speeds, with zero delay between pressing the capture button, the photo being taken, and then returning to the next photo. The single motion panorama feature is also excellent, which enables you to scan the horizon, before the Nexus stitches the shots together, rather than having to manually work with the images. It produced some bizarre and crazy results, often with obvious stitching, and quality seemed to be impaired too. There's a host of camera features, such as macro settings and ISO control, which saves what could have been a real problem for the Nexus, but we can't help being short changed, especially when the SII is due to get the Ice Cream Sandwich treatment, albeit not until next year. As you'd expect the Galaxy Nexus captures 720p video that looks fantastic on the Nexus' screen. The frame rate is excellent, colours vibrant, and it copes well when moving between light and dark. If you like getting creative with video, the Nexus is a top choice. The real star of the Galaxy Nexus show is the outing of Android 4.0, more commonly known by its development moniker Ice Cream Sandwich. For smartphone users, the operating system is a huge leap forward from 2.3 'Gingerbread' and noticeably better than the tablet OS Honeycomb. The most immediate difference is an overall performance improvement. Previous iterations have been less fluid and slick than iOS, especially rendering web sites, but Ice Cream Sandwich performs how you'd expect. Admittedly, that feature simply brings Android up to date, rather than enchant the user, or make you more awesome, but there's plenty that's new. The face unlock feature was the most immediately enchanting, where the front camera recognises your mug, and unlocks the handset. It's fast, slick, works from a variety of angles and immediately usable. Google pre-warns you that it's less secure than a PIN, and we were able to unlock the phone using a picture, but try as we might, lookalikes couldn't gain access to the handset. Most of the other improvements in Ice Cream Sandwich fall into the 'simplify my life' category. There's improved multitasking, where apps can we swiped away to quit and improved typing accuracy. There's also Android Beam for sharing content with other ICS users, Books which syncs with Google eBooks, Google+ for Hangouts, and plenty of new look interfaces. Overall, ICS is a big improvement, and feels like a mature mobile operating system, that's always led the field. The app Marketplace still can't touch Apple's App Store, but that's the last area that Apple leads Google in the smartphone race. Thanks to the improvements in ICS and that dual-core processor, the Nexus always feel sharp and responsive. A noticeable improvement is web page rendering, which has been given a major boost. It appears that ICS waits for the while page to be loaded, before rendering all in one go, rather than a piece-meal building of the site, which is traditionally how browsers work. Perhaps the improvement is perceptive, and by loading the site in one go, it's immediately responsive, but fast scrolling shows none of the jerkiness found in Gingerbread and Honeycomb. Our benchmark tests, however, revealed a startling trend. The Nexus scored twice as highly as the Galaxy S2, despite running the same processor. This shows the affect that Ice Cream Sandwich has on this handset, and it's one of the most powerful smartphones we've seen. While it might be too big for everyone's taste, the Nexus is a beautiful handset. The screen is vibrant and one of the best we've seen on any handset to date. With the addition of Ice Cream Sandwich, which marries great performance and slick features to the already an already potent operating system, it's one of the best smartphones available at present. There is a major problem, however. As we enter 2012, a 5MP camera on a top smartphone, which you will be potentially tied to for two years is not good enough. Yes, it's capable of good results, but imagining what could have been is truly disappointing. For many this will be a deal breaker, and while there's plenty of enchanting and life simplifying features, this smartphone is one feature short of being truly awesome. Samsung Galaxy Nexus price: From £34 per month on contract and £520 SIM-free for 16GB version See www.three.co.uk for more details.